The Memorial Day Holiday barbecue is often viewed as the traditional start of summer, that time of year when the beach, boats, friends and family all beckon to start the beginning of a great season. Why not try something special for Memorial Day 2017 by serving fresh Maine lobster cooked on the grill using our super-easy grilled lobster recipe. 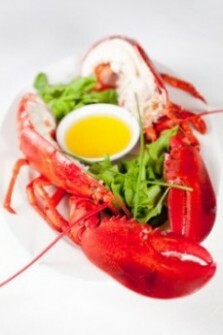 lobster meat but also adds a whole new dimension of flavor that you won’t get if you steam or boil the lobster. Grilled lobster also complements nicely any other seafood on the grill as well as meats and grilled vegetables. Grilling whole lobster is fast and easy and will be a crowd pleaser. So let’s get started. First, you must start with fresh Maine lobster from your fish market or favorite lobster delivery service. Be sure to ask for hard-shell lobster as opposed to soft shell, or “new shell” lobster. Soft-shell lobster meat is often to stringy to hold together on the grill and won’t taste nearly as good. Hard-shell lobster is best. Combine the butter, basil, and salt and pepper to taste in a food processor and blend until smooth. Pack the mixture into a medium ramekin, cover with plastic wrap and refrigerate for at least 30 minutes. Split the lobsters in half lengthwise. Bring the knife down through the tail, making sure to cut just through the meat and to leave the shell connected. Lay the lobster open, leaving the two halves slightly attached. Break the claws and legs off and crack slightly with the knife handle. Place the claws and legs on the grill over medium low heat and cover with a pie pan. Cook the claws and legs for 4 to 5 minutes per side. Next brush the lobster bodies with the oil and season with salt and pepper to taste. Place them flesh side down on the grill over medium heat. Grill 7 to 8 minutes. Remove the lobsters and slather with all the basil butter. Why not also add Steamers to your Holiday Barbecue? As we all travel this Memorial Day Weekend 2016 to be with friends and family and sit down to enjoy our meals, be sure to remember our veterans and those service members still serving so far away.